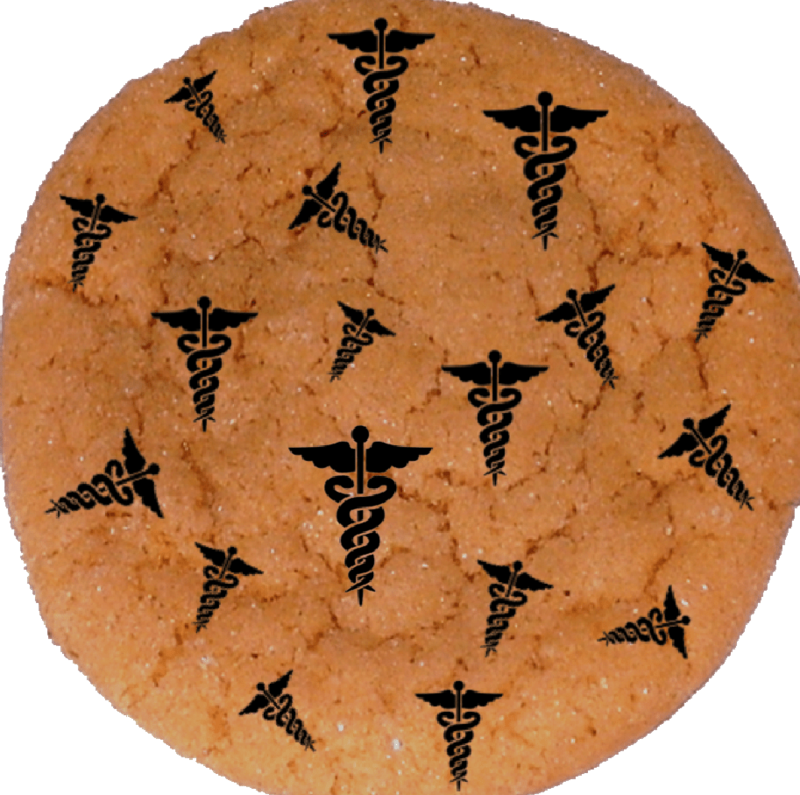 We all studied a lot for boards (some of us more recently than others) and one topic that is routinely covered in both the Pediatric and the Emergency Medicine realms is SCFE. So, it would stand to reason that we would all be well versed in it… but, the diagnosis of SCFE is still most commonly delayed (some studies report delays by as much as 6 months). 60-70% of pts with SCFE are obese. There is evidence that obese children can develop SCFE at even younger ages. ~25% develop SCFE on the contralateral hip within 2 years. ~60% develop ultimately develop bilateral SCFE. Force delivered across the physis significant enough to displace the femoral head. Inherent structural weakness leads to progressive displacement of femoral head. May be minimally displaced early on; making radiographic diagnosis difficult. Patient with Acute Slip is usually not a diagnostic challenge. Complaints of hip, going, and/or knee pain. 30-50% do not complain of hip pain! Initially, pain may be dull ache associated with exercise or movements requiring significant load across the flexed hip (ex, standing, climbing stairs). As slip increases, pain becomes more persistent and occurs at rest. Can affect gait (hip external rotation with toed-out gait and limp). 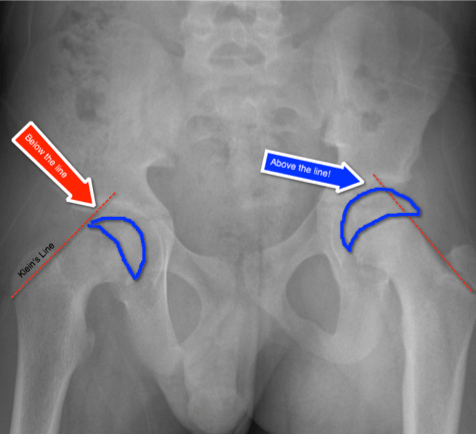 Near pathognomotic sign = as you flex the hip, the hip externally rotates. 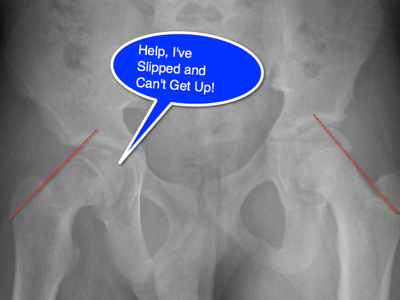 Chronic Slip may be subtle and missed on the AP Pelvis alone. 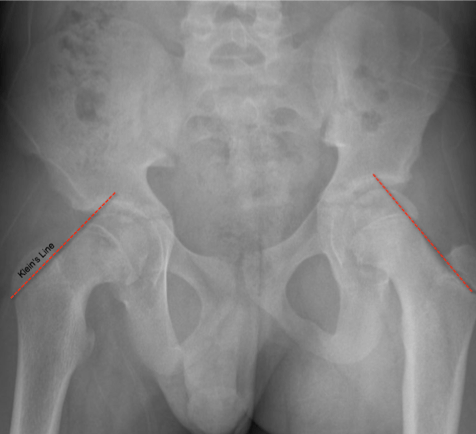 Klein’s Line (see below for depiction) drawn on the AP Pelvis is used to make the diagnosis. Frog Leg Lateral is more sensitive for detecting the condition, often showing the displacement posterior and medial to the femoral neck. Orthopaedic consultation is warranted and treatment in a timely fashion will benefit the patient as untreated SCFE will continue to progress. The patient should be made non-weight bearing until that can be achieved. Occasionally some reduction of the displaced is performed, but most often the treatment is pinning in situ. Avascular necrosis complicates ~15% of cases and is associated with severity and the acuteness of the slip. Outcomes after repair are good, provided the slip was detected before it has become severe (good outcomes in 70-75% with moderate slip; only ~21% with severe slip). Because the outcomes are significantly affected by the severity of the slip, it is necessary for us all to keep SCFE on our radar when evaluating a child with a limp or leg pain (even if it isn’t the hip or groin). Perron, AD, Miller MD, Brady WJ. Orthopedic pitfalls in the ED: Slipped capital femoral epiphysis. 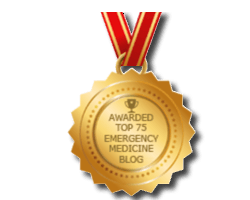 American Journal of Emergency Medicine. 2002, Sep; 20(5): 484-7. Murray AW, Wilson NI. Changing incidence of slipped capital femoral epiphysis: a relationship with obesity? J Bone Joint Surg Br. 2008, Jan;90(1):92-4. Nguyen AR, Ling J, Gomes B, Antoniou G, Sutherland LM, Cundy PJ. Slipped capital femoral epiphysis: rising rates with obesity and aboriginality in South Australia. J Bone Joint Surg Br. 2011, Oct;93(10):1416-23. Next story Pediatric Sexual Assault “Interviewing” – You are not a detective! Previous story Concurrent Meningitis in infant with UTI?